How do I manually transfer Capture recordings to my computer? Audio recorded with Capture Duo or Capture for iPad can be retrieved from the iPad by syncing the iPad with iTunes on your Mac or PC/Windows system. 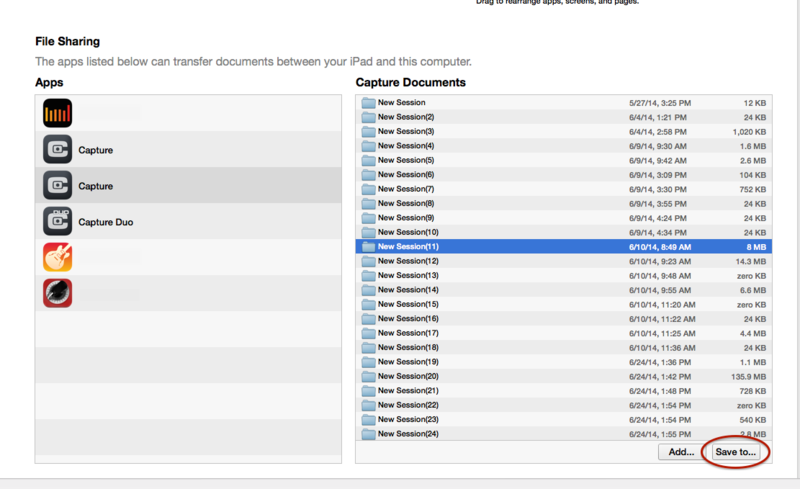 You can easily transfer all of your Capture sessions from your iPad to your computer with the following steps. 1.) Connect your iPad using it's data cable to your Mac or PC computer. 2.) Once connected, open iTunes on your computer. 3.) From iTunes, click the iPad button to access your iPad. 4.) Now click the "Apps" tab and scroll down until you see "File Sharing". 5.) Here you will see a list of "Apps" and you will find "Capture". Click "Capture". 6.) In the right panel you will see a list of all of your "Capture" documents. Select the "Capture" session you want to transfer to your computer and choose "Save to". 7.) Now you can choose a location on your computer's hard drive to save the "Capture" session to. Once your "Capture" session has been transferred to your computer's hard drive you can access the Capture session and it's audio files by opening the folder that was saved to your hard drive. Within this folder will be your Capture session file which you can drag to the Studio One "Start" page to open in Studio One. You can open the "Audio Files" folder to retrieve the recorded audio files. 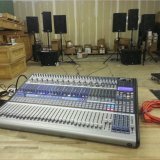 Ideally, the best way is to transfer the files into Studio One Free, Demo, Artist, Producer or Professional and then export or save your files as WAV or AIFF. As an alternative to using Studio One to convert the CAF file to WAV or AIFF, you can use a 3rd party application of your choice (there are many on the web to choose from) or use an online media converter such as (www.media.io) to convert the CAF file to WAV or AIFF or other format of your choice. Why does Capture Duo or Capture for iPad stop recording when my iPad goes to sleep? How do I save my Capture song after recording or making a change in it? Can I plug a microphone directly into my iPad with Capture Duo or Capture for iPad? my AudioBox iTwo microphone isnt coming up on Capture Duo on my iPad even with access granted to the microphone? Capture Duo and Capture for iPad asks for access to my microphone? Will Capture for iPad work with my StudioLive Ai console? Where can I find Capture Duo and Capture for iPad? Will you be adding an input gain control for the iPad internal mic to Capture Duo?